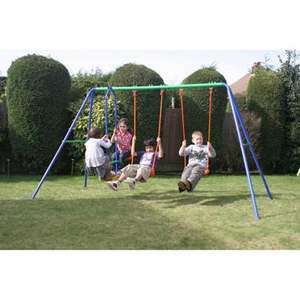 Smyths Toys Delta Double Swing and SeeSaw was £44.99, now £34.99! Double Swing and SeeSaw. Ideal for keeping kids quiet this summer! Was £44.99, now £34.99. Comes complete with ground anchors. Looks like a lot of toy for the money - can anyone recommend it from personal experience? Just make sure you get some proper ground pegs a its very light and will lift up when 2 children are ok it at the same time. We got this for 39.99 4 years ago still going strong been outside all the time and had a lot of play. The glider is not that robust for adults! Just what we were looking for - thanks! Deal posting newbie! This is dulum78 first deal post. Help out by leaving a posting tip or just to show your appreciation for their contribution.